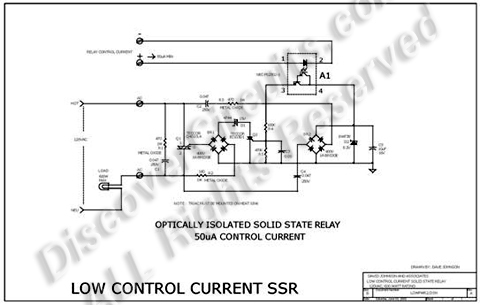 Circuit: s: OLID STATE RELAY REQUIRES ONLY 50uA DRIVE CURRENT __ Circuit designed by David A. Johnson, P.E. This circuit demands a control current that is 100 times smaller than that needed by a typical optically isolated solid state relays. It is ideal for battery-powered systems. Using a combination of a high current TRIAC and a very sensitive low current SCR, the circuit can control about 600 watts of power to load while providing full isolation and transient protection.